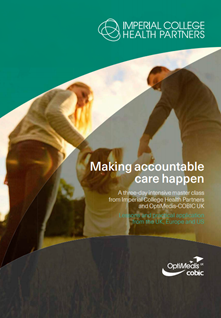 This master class has been created by OptiMedis-COBIC and Imperial College Health Partners, a partnership organisation bringing together NHS providers of healthcare services, clinical commissioning groups and leading universities across North West London. The three-day intensive master class will help healthcare leaders (individuals, teams and organisations) build sustainable models, encourage culture change, and support adoption of innovation in healthcare systems. With a view to innovative best in practice examples from Europe, Great Britain and the USA, the specific conditions and structures for the implementation of Accountable Care models will be discussed and elaborated. Leading scholars will contribute to the course. Professor James Barlow from Imperial College Health Partners & Imperial College Business School will contribute to the course with his great expertise in the adoption, implementation and sustainability of complex innovations in healthcare systems. Professor Stephen M. Shortell from the School of Public Health and Haas School of Business at University of California-Berkeley will share his extensive knowledge on performance assessment of accountable care organisations. The course will take place in London at Imperial College Business School from 10 to 12 October 2017 and is designed for international participants from various sectors and industries. We would be very pleased to welcome you there!